A trip to the dentist can be dreaded for some, but we want you to be confident in your smile. With Ordo, you’ll be better informed and connected. Ordo has a team of professionals who will share their top tips, passion, support and expertise with you. And you will never be embarrassed by that worn out and unhygienic toothbrush ever again. We all want a whiter, brighter smile but with professional whitening treatments at the dentist costing up to £700 a time, they aren’t within everyone’s reach. This month, however, sees the launch of a groundbreaking teeth whitening system set to change all that. Based on the same light activating technology used by dentists but in a portable kit for use at home, Luster Pro Light promises whiter, brighter teeth in as little as 30 minutes and with no tooth or gum sensitivity which can be a common and unwanted side effect of other DIY whitening treatments. Already a best-seller and close to becoming the No1 teeth whitening system in America where it first went on sale, Luster Pro Light is the UK’s first complete DIY teeth whitening system to use the same paint-on gel and activating ‘blue light’ technology used by dentists. Professional laser treatments, where this laser light is used to activate bleach applied to the teeth, are considered the safest route to a brighter smile but are also the most costly. Priced at £49.99 the Luster Pro Light system costs a fraction of the price of professional treatments and it already has a pre order waiting list when it goes on sales at Boots.com this month. Up until now, trays and strips have been the most popular DIY treatments. Trays come with a whitening agent that you attach to your teeth but can be fiddly and because the trays aren’t custom-fitted they can cause uneven distribution of bleach and spotting on the teeth. Whitening strips are also popular but can only whiten the front teeth. The three-step Luster Pro Light kit carries some of the strongest claims on the market and is based on an easy to use rinse, brush and light regime that visibly whitens teeth in half the time of other trays, strips, gels and rinses. Most importantly, it won’t cause teeth or gum sensitivity and soreness, symptoms often experienced with other home whitening systems. In as little as 30 minutes, users reported teeth whitening of up to six shades lighter than their original shade. Step 1: Rinse with the mouth wash for 10 seconds. Step 2: Brush the whitener gel on your top and bottom teeth. Step 3: Hold the whitening light about six inches from your teeth for 2 minutes. There is a built-in timer, so no need for a stopwatch. Repeat the process 10 times and the treatment is complete. 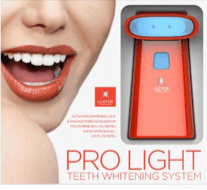 Luster Pro Light is part of the Luster Premium White range, a daily oral care whitening regime which has become a runaway success since its launch. Close to becoming the most popular home whitening system in America, the range also includes whitening toothpastes and mouthwash that can be used daily to maintain the results of the Pro Light system, keep teeth white, gums healthy and to freshen breath. Developed using a breakthrough whitening complex, the Luster NOW! Instant Whitening Toothpaste will instantly whiten teeth after just ONE Brush. This convenient 3-pack is perfect for work, home and for travel and this daily anti-cavity toothpaste gentle enough for daily use. 1. Use whitening toothpaste in conjunction with a teeth whitening system to keep the shine from fading and stains at bay. 3. Invest in an electric toothbrush to keep your smile cleaner and whiter. A high quality electric brush will remove most stains from the surface of the teeth which, over time, will help take teeth back to their original colour. 4. Crunchy, crispy fruits have an abrasiveness that can help to lift stains from the teeth and give the illusion that they are whiter. Try munching on apples, celery and carrots, which have enough abrasiveness to clean the tooth surface without harming the enamel. 5. Watch the tea, coffee, juice and wine – they’re all oral-bling killers. Poor dental and oral care is putting millions of people in the UK at risk of health issues. New research has discovered all too many adults are unaware of just how important a healthy mouth is – leaving them vulnerable to gum problems, such as bleeding gums, tooth loss and even a heightened risk of cardiovascular disease. The research was commissioned by the Simplyhealth Advisory Research Panel (ShARP) to find out more about the nation’s oral health habits and the different attitudes between genders. The panel is a body of independent experts set up to help communicate the latest intelligence on a variety of important health areas. They have been brought together by Simplyhealth – one of the UK’s leading healthcare providers. ShARP takes a closer look at the UK’s oral care habits. •	Nearly three quarters of those questioned (73%) said they only changed their toothbrush every six months or more. •	More than half of all respondents (59%) said they would refuse to lend their own toothbrush to anyone. Of the 41% who said they would lend out their brush, most (23%) said it would be to their partner, with just 5% saying they would lend their brush to their child. Nearly two thirds (63%) admitted they had noticed blood in their spit at some time or other after brushing their teeth – a classic symptom of gum disease. Nearly four out of 10 (38%) said this was at least once a week, with 13% saying it was every day or almost every day. More than half (53%) thought blood in spit was considered a worrying sign and a greater number (60%) said they would be worried about their children leaving blood in their spit. Just under half (45%) correctly thought that blood in the spit or in the sink after brushing could be a sign of potential tooth loss later in life. More than three quarters of those questioned (80%) agreed that there was a link between oral health and general health – men were far more likely than women (27% compared to 16%) to wrongly presume that there is no connection. Respondents showed a mixed bag of knowledge when it comes to the health conditions that poor oral health is linked with. Nearly half (42%) thought gum disease and tooth loss (42%) were linked with oral health issues, followed by heart disease (26%), diabetes (15%), cancer (14%), poor pregnancy outcomes (7%), osteoporosis (6%) and stroke (34%). In fact, all these conditions are linked with poor oral health. Three quarters of those polled said they would aim to brush their teeth better and take better care of their dental health if they knew for certain that poor oral health was associated with serious health conditions. However, men were more likely than women (27% compared to 22%) to refuse to change their current oral care regime even if they were aware of a health link. Men were less likely than women to care about the effect a person’s lost teeth had on their appearance and were more likely than women to say that lost teeth made no difference to them at all (16% compared to 11%). Men were far more likely than women to be unconcerned about losing teeth themselves in later life (51% compared to 31%). When it comes to the sorts of foods that are most likely to get lodged between the teeth and become annoying, bits of gristle from meat was named as the worst with more than a third (35%) of respondents complaining about the problem. This was followed by peanuts and other nuts (20%), vegetables such as spinach (11%), crisps (10%) and bread (6%). Half (50%) of the respondents questioned admitted the cost of going to the dentist has put them off visiting a dentist for a check-up or routine dental work – 15% said this was a common occurrence. When it comes to covering the cost of dental care, nearly two thirds (62%) said they would be happy to pay the equivalent cost of a newspaper a day to make sure their or their family’s dental health was secure. The vast majority (91%) felt it was important to have regular check-ups at the dentist, however 21% of women and 29% of men admitted they hadn’t visited a dentist in the last year for a check-up or any other work. To help communicate the latest studies and intelligence on oral care matters and a variety of other important health areas, Simplyhealth – one of the UK’s leading healthcare providers – has launched a new information group. The new Simplyhealth Advisory Research Panel – ShARP – will become a leading source of information and data, helping to make more people feel better by exploring ground-breaking research and discussing the latest scientific and medical thinking. •	deliver breaking news on health issues and research that affect individuals and families. The company is proud of its 140-year tradition of excellence in healthcare service and its strong tradition of caring for customers as true individuals. The company aims to help people access affordable healthcare and in doing so deliver exceptional personal customer service. Simplyhealth has over three million customers and patients, serving nearly four million people, and is also a healthcare provider to 20,000 companies. While the company has changed and adapted over the years, its award-winning commitment to do the right thing by its customers has not. Simplyhealth is committed to its strongly held values and to supporting communities. With no shareholders, it only invests its profits into running the business for the good of its customers, or making donations to health-related charities with £1.6m given away last year. The company has always complemented the NHS. Its cash plans help people with their everyday health, whether they use NHS or private practitioners. The private health insurance works alongside the NHS, and is often provided by companies as an employee benefit to help staff at times of ill health. Fatal fangs – is your mouth making you ill? Gum disease affects 70% of the population in varying degrees. In its mildest form, gingivitis, the tissues of the gum surrounding the teeth become inflamed and bleed. Left untreated this may progress to more advanced forms of the disease known as peridonitis where the gums shrink and teeth may fall out. But increasingly gum health is now seen as a marker for more serious health problems including cardiovascular disease and diabetes. It is also increasingly implicated in problems in pregnancy such as premature births and underweight babies. So the extent of gum disease in the general population is a real and growing health concern. US statistics reveal that by the age of 17 60% of the population have early signs of the disease and by the age of 50 this translates to periodontal disease for 70-80% of the population, with half suffering the severest form. In the past research attempted to investigate the cause of gum disease but more recently the emphasis has switched its affect general health and its links to several serious illnesses. The evidence points to an assault on the bodys immune system from the bacterial infection in the mouth as a result of gum disease which leads to a degeneration in general health. If we look at the total surface area of the roots of a full complement of adult teeth, the area is approximately equivalent to the size the forearm. If you then imagine this whole area is teaming with a cocktail of millions of bacteria which the body is fighting off on a 24-hour basis, you can imagine how this might undermine the immune system. In the US research indicates that gum disease is a risk factor for atherosclerosis (furring of the arteries) and thromboembolic (blood clotting) incidences. In other words gum disease increases the risk of stroke and coronary heart disease. Again the theory is that the bacterial load placed on the body together with the fact that some individuals have a greater predisposition to a heightened inflammatory response leads to both gum and cardiovascular problems. So it is prudent for all of us to take preventative oral hygiene measures, as well as sophisticated diagnostic tests that screen for levels of certain substances associated with heightened health risk, such as that for the protein homeocysteine, which is implicated in both cardiovascular disease and Alzheimers. Bacterial analyses can also be carried out. It is now accepted that treatment of gum disease can lead to an improvement in cardiovascular health and that the health of a patients gums is now seen as a risk marker for heart disease. Smoking is another modifiable risk factor for both gum and cardiovascular diseases. Scientists at the University of Helskinki recently concluded that gum disease can no longer be considered just a local problem but one for the health of the whole body. Gum disease is increasingly implicated in adverse pregnancy outcomes such as premature births. The University of North Carolina identified it as a significant risk factor for preterm labour, premature rupture of membranes, small-for-gestational-age (babies who are smaller than expected even for premature babies) and low birth weight babies. Additional research at Tulane University in New Orleans in three clinical trial studies determined that the treatment of the gum condition led to a 57% reduction of preterm low birth weight and more significantly a 50% reduction in preterm births. Evidence now suggests that severe untreated gum disease increases the risk of diabetic complications, and that these symptoms can be alleviated by treatment. It is thought that uncontrolled severe periodontal disease has an adverse effect on sugar levels and that anyone with a family history of diabetes is advised to take a blood test. General medical physicians do not usually examine or screen their patients for signs of gum disease, but given the mounting evidence implicating it in many of the diseases of ageing they should. 	The average toilet seat harbours fewer bacteria per square centimetre than the human mouth! The temptations of the festive season usually leave many of us in need of some New Year revitalisation. All the excesses of the party season often means starting a diet and exercise plan to help us look and feel slimmer, fitter and healthier. But its not just a fitter and healthier body we should be concerned with  our teeth may also need some TLC. A month of consuming seasonal specialities means they may spend more time exposed to the consequences of sugar and carbohydrates, which is worsened by occasionally falling into bed after many a Christmas party without cleaning our teeth. The good news is, by following our guide; both your mouth and midriff can get into great shape. A healthy mouth means a healthy body – doctors have already established link between gum disease and other medical problems. So a clean and healthy mouth can therefore improve your overall health. When eating for a healthy mouth, there are important considerations  like eating nutritious meals, being aware of the amount and timing of consuming sugars and carbohydrates, and maintaining good oral hygiene after meals and snacks. The key to a healthy, balanced diet and lifestyle are eating the right amounts of a variety of foods, and being physically active. To help us eat well, the Food Standards Agency recommends that we choose foods from each of the five major food groups: breads, cereals, and other grains; fruits; vegetables; meat, poultry and fish; and milk, cheese and yogurt. An adequate supply of nutrients from all five food groups promotes healthy teeth and gums as well as a healthy body. Eating foods that contain sugars and carbohydrates of any kind can contribute to tooth decay, if left unchecked. And foods you least expect contain sugar, however, they shouldnt be removed from our diets because many of them contain key nutrients and these foods also add pleasure to eating. Get some juicy gossip – drinking fruit juices and smoothies as part of a New Year renewal can help to boost vitamins, and are okay for your teeth if you pay attention to your oral care – check out our mouth and teeth MOT tips below. Protective foods  some foods help protect against tooth decay. For example, hard cheese increases the flow of saliva. Cheese also contains calcium, phosphate and casein, a milk protein, which protects against demineralization. Finishing a meal with a piece of cheese helps counteract acids produced from carbohydrate foods eaten at the same meal. Milk also contains calcium, phosphate and casein, and the milk sugar, lactose, is less cariogenic than other sugars. Know your carbs – most nutrition panels on food labels give values for carbohydrates, including a breakdown of sugars and starches. Read the labels and choose wisely to meet your energy and nutrient needs. After a meal or snack, one of the easiest ways to help prevent the build up of plaque and eventual tooth decay is to chew sugarfree gum such as Orbit Complete after eating and drinking. Thats because the action of chewing stimulates saliva production  natures very own ingredient for getting rid of harmful acids in the mouth. Saliva works its magic in three ways. First, it helps to dilute and wash away food and other debris left in the teeth and mouth after eating. Then it helps to neutralise the acids in the mouth. And as if that wasnt enough, the calcium, phosphate fluoride, and hydroxyl ions in saliva helps to protect against early damage of tooth enamel. Plus, chewing sugarfree gum is a great way to freshen your breath after eating, and as an added bonus, chewing also keeps your mouth busy so you wont be tempted to go back for seconds, or snack on your favourite nibble after your main meal  all good news if youre trying to manage your weight and keep teeth healthy. § Make a dentist appointment – If you do not visit your dentist regularly, make an appointment -the dentist can tell you how often you should have a check-up. § Floss and use mouthwash – To clean the areas that your brush may not be able to reach, dental floss and special brushes clean in-between your teeth. Using mouthwash can also help to freshen breath and kill bacteria. Drs Raj Parkash and Nigel Agger are two of the best dentists and cosmetic dentists in the business today. They work with a passion to deliver the best outcome for their patients. What they say: “The Harley Dental Implant & Cosmetic Centre is a clinic dedicated to providing the best in dental implantology and cosmetic dentistry. We are internationally renowned for our exceptionally high standard of implant and general dentistry. We are committed to providing the ultimate standard of quality service in restoring and maintaining your dental health in an atmosphere of professionalism and clinical confidence. Our aim is to create results for our patients, which enhance the quality of their lives through our dedication to understanding their fundamental needs by means of precise and clear communication. Forma is established by Dr Raj Kumar who trained at Guys Hospital London. He has over 17 years of cosmetic dentistry experience and is fully compliant with Procera, Empress, Lava, Zirconia and Da Vinci porcelain systems. He also has over 8 years of experience with Nobel and Simplant implant systems. In 2004 Raj achieved simultaneous qualifications in Botox and Dermal filler wrinkle therapy and Invisalign. The same year Raj achieved Platinum status and in 2006 he became a Preferred Invisalign Provider. Dr. Raj Kumar has treated over 300 cases to date with Invisalign and all have been very successful. Dr. Kumar is now being trained in advanced dental occlusion at the Pankey Institute Miami Florida. London: Cancer of the mouth is on the increase as a result of poor oral hygiene, according to the latest statistics issued during Mouth Cancer Awareness Week. More than 1700 people die of mouth cancer in the UK each year – obviously the figure worldwide is far larger. Dentyl pH®, the mouthwash experts, are providing an education grant to support this years British Dental Health Foundations – Mouth Cancer Awareness Week  11-17th November 2007. On average mouth cancer now kills one sufferer every five hours, making it one of the fastest growing cancers. This is the first year that Dentyl pH has sponsored the annual Mouth Cancer Awareness Week campaign. Dentyl pH was created as an alcohol-free mouthwash by people who care about mouths; that is, by dentists themselves. As a result, its very appropriate that Dentyl pH should be part of a campaign that encourages people to be more aware of their dental health. Mouth cancer is avoidable and early detection can massively increase the chances of survival. The Dentyl pH is a clinically proven, alcohol free mouthwash. Using groundbreaking technology, Dentyl pH works like no other mouthwash. This is because it is a two-phase mouthwash, which has to be shaken before use. This action causes the essential oils and the antibacterial water phases to mix, creating a special solution, which makes the ‘bad’ bacteria and food debris adhere to the mouthwash solution. As a result, when the mouthwash is expelled from the mouth, bacteria, debris and other dental deposits are all visible in the sink, proving that Dentyl pH really works. * more than half of all teenagers and three out of four adults over the age of 35 suffer from gum disease. Bacterial plaque plays an essential causative role in gum disease, yet it can be removed easily from the teeth by brushing the teeth for two minutes, twice a day, followed by rinsing with a proven mouthwash such as Dentyl pH. Flossing is recommended once a day between brushing and rinsing. London: With New Year round the corner, you may be starting a new regime to look after yourself better in 2008. Why not start the easy way, by replacing your regular toothpaste with a super toothpaste that will not only whiten with the natural power of baking soda, but will care for your teeth. Check out the products below and care for your smile the easy way into next year! **NEW** Arm & Hammer Enamel Care Sensitive® 75ml (RRP £3.49) – Great for those with sensitive teeth. From the leading baking soda brand, Enamel Care Sensitive removes the cause of sensitivity by sealing the teeth and protecting exposed nerves to offer lasting relief from sensitive teeth, by fixing the cause. It is the only sensitive toothpaste to contain Liquid Calcium® which fills in the tiny crevices to restore the enamel surface. Liquid Calcium® technology repairs the teeth and seals them to form a protective shield in only three months. The baking soda offers deep cleaning and stain removal restoring teeth to their former whiteness. Arm & Hammer Enamel Care® 75ml (RRP £3.49)  Great for teeth previously weakened by acids in food and drink. Contains the innovative patented technology Liquid Calcium® to remineralise teeth and restore surface enamel. Containing 8 times the amount of mineral ions found in saliva naturally, it actively reverses the effects of acids in everyday food and drink. It thus increases the gloss of teeth as well as whitening gently and naturally. Containing fluoride to strengthen teeth and fight cavities more effectively. If you would like to receive 12 months supply of Arm & Hammer please email us at readeroffer@elixirnews.com by 11 November 2007. Please state whether your preference is for either the Enamel Care or Enamel Sensitive. London: he number of people having their teeth whitened has increased since the smoking ban came into force. The British Academy of Cosmetic Dentistry (BACD) said there had been a “marked increase” in demand for whitening treatments since the UK ban was introduced on July 1. BACD board members reported the rise, with some practices seeing the number of people opting for treatments shoot up 40%. On average, respondents noted an increase of 12%. Teeth whitening is the most popular cosmetic dentistry treatment, followed by white fillings, veneers, crowns and bridges. Christopher Orr, a dentist and BACD president, said: “It appears people are smoking less now due to the ban, so it is not a surprise that many would like an improved smile to go with their better health. “Once they reduce or even stop their consumption of cigarettes altogether, people notice the visible damage done to their teeth and for the first time feel confident enough to do something about it. A previous BACD survey found that four out of five people were unhappy with their smiles and up to a fifth concealed their teeth in photos. London: Marketing has been named as the UKs Most Plaque Prone Profession according to new research from Orbit Complete sugarfree gum, which compares the daily dental, chewing, drinking and smoking habits and working lifestyles of different professions to reveal the ‘Top Five Most Plaque Prone’. Others in the top five include agriculture, transport, manufacturing and public sector. Marketing people appear to be spending too much time ‘thinking outside the box’ and not enough about their teeth. Over a third (38%) never floss and 22% never use mouthwash as part of their dental regime. Even worse, entertaining clients mean that over half (54%) regularly** drink alcohol and a quarter smoke (24%) which could be detrimental to the health of their mouth and teeth. Healthcare professionals and teachers do practice what they preach when it comes to teeth, with 80% brushing their teeth twice a day. Over a third (37%) of teachers also regularly** drink a glass of milk, making them top of the class at break-time as milk is packed with calcium that helps to keep teeth strong and healthy. Office workers are also remaining focused, brushing their teeth twice a day (79%), and taking care of themselves through a healthy diet (88%) and 27% make sure they chew sugarfree gum after meals in order to look after their teeth. Other top chewers, mindful of oral hygiene while at work include retailers (30%) and construction workers (21%). The survey reveals that health habits are also influenced by geography and gender with employees in the South-East being the most regular brushers (74% brushing twice a day) and Scottish workers the least regular (59%). However, both regions recognise the benefits of sugarfree gum with 1 in 5 (20%) chewing it daily. On the other hand, women get fresh more often than men with 72% brushing their teeth twice a day compared to 61% of men. London: More than one in three Brits admit to alleviating stress by drinking and one in five by smoking, but nearly two out of three were unable to identify both of these as leading causes of mouth cancer. The new research, conducted for Mouth Cancer Awareness Week (12-18 November) by dental payment plan company Denplan found that while most Brits could identify smoking as a cause of mouth cancer, nearly two-thirds could not identify drinking as a leading risk factor of the disease. Moreover, respondents in the most at-risk age group for contracting the disease (those aged 45 and older) were the least able to identify smoking and drinking as a major cause of mouth cancer. Almost half of those questioned admitted to feeling stressed at least oncea day and, given the high percentage of those who turn to cigarettes and alcohol to cope, this indicates that the prevalence of mouth cancer in the UK may be linked to the way we relieve the pressures of modern life. 4,400 new cases of mouth cancer are diagnosed each year in the UK, and the disease kills more than 1,700 annually. Although Brits regularly drink and smoke as an escape from the stresses of jobs, family life and other commitments, more than 20 per cent did not recognise one of the early warning signs of the disease, an ulcer that does not heal, and a quarter of people would not go to the dentist if they had a mouth ulcer that persisted for weeks. The results suggest a worrying lack of awareness, and a danger that todays over-stressed population may be in for a big health scare later in life. The chances of surviving mouth cancer can increase from 50 per cent to nearly 90 per cent if they are detected and treated early. Dr. Henry Clover, Dental Advisor for dental payment plan company Denplan, said: While alcohol and cigarettes may help alleviate feelings of stress in the short-term, over time this lifestyle can pose a serious health risk and significantly increase the likelihood of developing mouth cancer. About the research:- The research was carried out for Denplan by Tickbox.net from the 22nd September to the 5th October 2006 using a survey sample base of 1783. About AXA AXA is a world leader in financial protection. AXAs operations are diverse with major operations in Western Europe, North America and the Asia/Pacific area. AXA employs 120,000 staff and tied agents and, as of 31 December 2005, had 1,064 billion in assets under management. AXA reported total IFRS revenues of 72 billion and IFRS underlying earnings of 3,258 million for the full year 2005. Our previous company performance is not a guide to how we may perform in the future. AXA ordinary shares are listed on the Paris Stock Exchange; AXA American Depositary Shares (ADSs) are listed on the NYSE under the ticker symbol AXA. About Denplan Denplan Ltd., part of the AXA Group, is the UK’s leading dental plan provider with an approximately 80% market share. Denplan has more than 6,000 member dentists nationwide (around a third of General Dental Practitioners) and over 1.6 million registered patients. The company was established in 1986 by two dentists who pioneered the concept of dental payment plans. Varna, Bulgaria:A radiant smile is hard to resist but the cost of whitening and veneers can be prohibitive. Now a new clinic, the Dentaprime, is offering the latest cosmetic dental treatments at a fraction of the price elsewhere. The first three seconds decide what effect you have on another person. A naturally radiant smile is almost impossible to resist. On the other hand teeth get discoloured in the course of time, or even turn brown. Coffee- and tea-drinkers and smokers are particularly affected. But help is at hand from professional tooth-whitening procedures, otherwise known as bleaching. The Dentaprime Dental Clinic at Varna in Bulgaria provides one of the safest and most efficient bleaching methods there is – with the most up-to-date equipment and at reasonable prices. The idea of whitening teeth is not new. But the ultrasound bleaching system is! Analysis of a long-term study has shown that ultrasound bleaching, using the Dentaprime Clinic (QuickWhite ©) system, is the most efficient and safest professional tooth-whitening procedure to have a long-term effect. There is no change to the structure of the teeth and treatment is extremely gentle. One particular advantage is that the dentist can adjust the colour of fillings and crowns. This means that your smile is completely natural and white. To start with, your teeth and the spaces between them get a completely professional clean. Then the dentist applies the patented QuickWhite© contact gel, depending on the condition of your teeth and the desired result. After this you relax comfortably for about 40 minutes in a specially designed chair, the KaVo Primus, manufactured in Germany. The whitening process uses ultra-sound and provides the best possible result. DIY tooth whitening systems Adhesive whitening strips from the discount pharmacy or so-called DIY systems, are not an alternative to professional bleaching in a dental clinic. Users frequently report unsatisfactory results, even though they may have followed instructions to the letter, sometimes for weeks on end. ‘Not much white for rather a lot of money’ seems to be the general feeling. In the Dentaprime Clinic the patented bleaching process costs about sixty per cent less than in the UK. As well as receiving treatment many patients use the opportunity to take a short holiday on the Bulgarian Black Sea coast. The Dentaprime Dental Clinic for implantology and cosmetic dentistry on the Bulgarian Black Sea coast is among the most modern in the whole of Europe. It combines highest quality standards with significantly lower treatment costs than in Great Britain. Its seven implantation rooms and five prosthetic rooms are equipped with the most modern medical apparatus, manufactured by world market leaders KaVo. The implant systems come from Switzerland, from well-known manufacturers, Nobel Biocare and Straumann. Patients are cared for and treated by experienced and English-speaking implantologists, dental technicians and medical assistants, who have all been trained to western European standards. New York: A plastic coated pill that treats bad breath and gum disease through a slow release mechanism is being developed in the US. The pill would be implanted in the mouth and release drugs including salicylic acid to kill germs and bacteria. Gum and peridontal disease are a major cause of ill health and scientists below maybe linked to heart and cardiovascular disease. Periodontal disease can also lead to loss of teeth as the gums shrink. London: A quarter of the UK population has undergone cosmetic dentistry according to new statistics from the British Academy of Cosmetic Dentistry and Mintel. They show that just over a quarter (26%) of the population have had some type of cosmetic dentistry procedure, of which teeth whitening and white fillings are the most widely experienced. The national representative sample of over 2,300 adults participated in the online survey which identified the incidence in cosmetic treatments, a market estimated to be worth in excess of £280 million, within the UK population. The survey also examined levels of awareness among the public, as well as the most popular vehicles currently used for the promotion of aesthetic procedures. The study also highlights a low public awareness of the availability of cosmetic dental treatments. Previous studies by the BACD show over 93% of practices offer cosmetic procedures, yet only 17% of the population think their dentists can provide these. Women aged 35-44 are again most likely to have requested white fillings, while crowns and bridges for cosmetic purposes are most prevalent amongst women aged over 45, but significantly lower amongst the older male population. Usage among these age groups suggests cosmetic dentistry is being sought to enhance appearance, and not merely ward off the deterioration of teeth as a result of the ageing process. Over one in ten (11%) of adults appears to have an interest in cosmetic dentistry, either having discussed or interested in discussing cosmetic dentistry with practitioners and friends. Television makeover shows are a popular genre, with just over half of the respondents (51%) claiming to watch these programmes as a way of judging the results of cosmetic treatments. Just over one in ten (12%) claimed to be regular viewers, with a further 39% reporting that they watched them occasionally. Women are the main viewers of TV makeover shows, with 17% of women claiming to be frequent viewers and 49% occasional viewers, demonstrating their huge reach amongst women, compared with only a third of men. Los Angeles: Dental disease is a risk factor in stroke, according to new research from the the University of California Los Angeles. Researchers have discovered that the disease is more prevelant in people with blockages of the main blood vessels leading to the brain (carotid artery). These blockages, or atheromas, contain calcium and can be detected on dental panoramic radiographs. The results came from a study to see if dental disease shown on a panoramic radiograph is greater among people with atheromas seen on their dental radiograph than among people without atheromas but matched for stroke risk factors (body mass, smoking history, need for medications to control hypertension, hypercholesterolemia, and diabetes). The group with carotid atheromas seen on dental panoramic radiographs was found to have more dental disease, as determined by the number of teeth with decay, missing teeth, and the amount of bone loss around teeth, than the group without any radiographically detectable atheromas. The results of this study, Does Dental Disease Influence Prevalence of Panographically Imaged Carotid Atheromas?, indicate that dental disease may play a role in the formation of carotid atheromas in patients already at risk for stroke. It was conducted by E. Chung, A.F. Friedlander, E.C. Sung, and N.R. Garrett, of the University of California-Los Angeles, USA, presented on July 1, 2006, at the Brisbane Convention & Exhibition Centre, during the 84th General Session of the International Association for Dental Research.